The idea that Global Warming is a natural cycle is well understood from paleo data covering the past 1 million years. Is there a difference between current climate, and the natural cycle? For the past million years the natural climate has oscillated between warm periods and ice ages. This shifting in and out of warm periods and ice ages is correlated strongly with Milankovitch cycles. In order to understand the difference between natural cycle and human-caused/influenced global warming, one needs to consider changes in radiative forcing and how this affects systems on Earth such as the atmosphere, vegetation, ice and snow, ocean chemistry and ocean heat content overturn cycles and related effects. The current radiative forcing levels are clearly outside of the natural cycle range. Is global warming a natural cycle? Or is global warming affected by human influence? What does the science say? Both are true. In the natural cycle, the world can warm, and cool, without any human interference. For the past million years this has occurred over and over again at approximately 100,000 year intervals. About 80-90,000 years of ice age with about 10-20,000 years of warm period, give or take some thousands of years. The difference is that in the natural cycle CO2 lags behind the warming because it is mainly due to the Milankovitch cycles. Now CO2 is leading the warming. Current warming is clearly not natural cycle. Where are we currently in the natural cycle (Milankovitch cycle)? 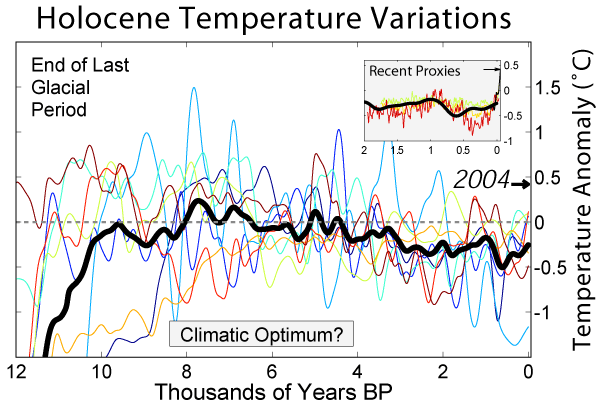 The warmest point of the last cycle was around 10,000 years ago, at the peak of the Holocene. Since then, there has been an overall cooling trend, consistent with a continuation of the natural cycle, and this cooling would continue for thousands of years into the future if all else remained the same. But since 1750 however, the CO2 content of the atmosphere has deviated from the natural cycle. Instead of decreasing, it has increased because of the fossil-fuel burning. Methane and nitrous oxide have also increased unnaturally because of agricultural practices and other factors. The world has also warmed unnaturally. We are now deviating from the natural cycle. The natural cycle is understood by examining the paleo records. The fact that the earth goes in and out of ice ages distinctly outlines the natural cycles of Earth's climate. This occurs about every 100,000 years. We are currently in a warm period. Generally, Earth spends about 80-90,000 years in an ice age and around 10-20,000 years (or so) in a warm period. The Holocene temperatures peaked around 8,000 years ago. This temperature peak was associated with the perihelion phase of the Milankovitch cycles. That was when it is estimated that the natural cycle climate forcing was at maximum, including associated climate feedbacks. Since then the forcing levels have been slowly dropping and the temperature has been following the slope of forcing in line with the changes in the Milankovitch cycle forcing combined with system feedbacks. Recent significant changes in climate forcing due to human cause factors have produced a net positive forcing causing temperatures to rise. This is a departure from the natural cycle. 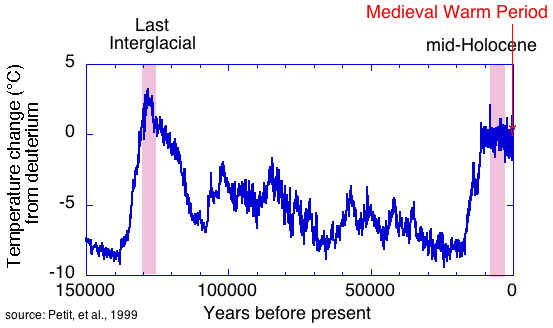 The current global mean temperature (GMT) is above the temperature peak associated with the forcing imposed on the climate system when we came out of the last ice age. 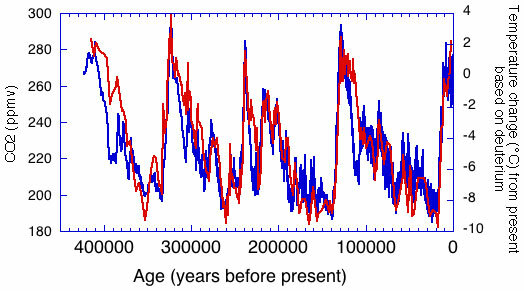 In the image below we can see that the cycle has been fairly regular for the past 450,000 years. The last 5 million years of climate history shows us settling in to our current 100k year cycles. The image below shows the climate was much warmer prior to 7 million years ago. Here we can see the Eocine optimum and the PETM event, which is assumed to have involved a methane hydrate clathrate release that caused a temperature spike. The past 542 million years of climate as it is currently understood. There are many reasons for the dramatic temperature differences and science is continually investigation to better understand past climate. Some of the reasons include Pangaea which is when the land mass of earth was connected 250 million years ago. Imagine the more land all facing the sun. Easy to understand how that can produce a warmer world. But that is an oversimplification of influences and science is never entirely settled but rather investigated further. That does not mean that there are many things we understand fairly well or are even very certain of. Don't assume that because knowledge is not perfect that one can not have a very strong understanding of what influences climate. In our recent history, the past one million years, we have very strong understanding of climate influences. Mulitin Milankovitch calculated the cycles that influence the general climate of earth in the early part of the 20th century. It was not until after his death that his hypothesis was confirmed by the deep ocean sediment core studies. These cycles increase and decrease the amount of solar forcing imposed within our climate system and that actually causes the temperature to rise and fall with calculable regularity. The more time the earth or land mass spends closer to the sun (at perihelion), the more energy it receives thus warming. The more time it spends farther form the sun (at aphelion) the less energy it receives and the earth cools. The 'eccentricity' cycle period is around 100,000 years. This causes the orbit of the earth to elongate or become more elliptical. Imagine that the more elliptic it becomes, the less time during the year it spends near the sun. So the planet receives less solar energy and cools a bit. The 'obliquity' cycle tilts the earth every 41,000 years and that causes the land mass of the norther hemisphere to face more towards the sun or less towards the sun. The 'precession' cycle occurs about every 26,000 years and influences the wobble of the polar axis. This also influences earths climate by causing winters and summers to be warmer or colder depending on the amount of land surface being more or less exposed to the sun. These are three main influences considered in the Milankovitch theory that regulate the general amount of energy received in our earth climate system. As we warm and cool, more or less of our natural greenhouse gases are released into the atmosphere, or stored in the oceans, ice and earth. The sun also goes through cycles. Solar observations began in the time of Galileo. Even then they noticed that the number of sunspots changed and might be connected to climate. This sunspot cycle was detected as early as the 5th century. NASA began taking satellite readings of the total solar irradiance in 1978. Over the years, they refined their ability to calculate the total solar irradiance and we now have a very accurate measurement of the amount of energy that reaches our outer atmosphere. The main difference between the natural cycle and what is now called the anthropogenic cycle is that we have altered the atmospheric composition of greenhouse gases and therefore increased the climate forcing. This following image shows the last 800,000 years of temperature and forcing levels. Essentially, we have largely departed the climate forcing from the natural cycle.